ONEKAMA — Wearing a wide smile, Stephen Verrett executed the slightest of fist pumps while walking off the mound. A called third and final strike cued the Onekama senior’s celebration, which looked about as effortless as the gem he had just woven. Verrett no-hit Traverse City Christian on Friday to salvage a split for the Portagers in a 4-0 victory in the doubleheader’s nightcap. He silenced the same lineup that mercied Onekama (4-8-1) in the five-inning opener, 15-1. His coach couldn’t agree more about Verrett’s six-inning no-hitter, in which he allowed just three walks with nine strikeouts. Verrett served as his own run support too. After Eno drew a walk on a full count with the bases loaded in the bottom of the second inning, Verrett knocked a three-run double on the first pitch he saw to give the Portagers the 4-0 lead that would hold up the rest of the way. Both Eno and Verrett finished the nightcap batting 1-for-2 while Dallas Hearit was 1-for-1 with a run scored for the Portagers. Verrett finished his outing with two quick flyouts to start the top of the sixth before walking his second and third batters of the night. Verrett kept his poise and notched his second career no-hit outing with a strikeout. 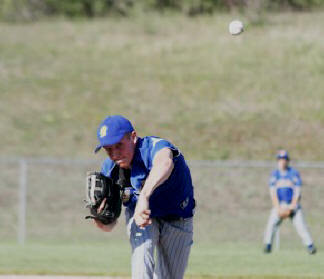 Last season, he no-hit West Michigan D League foe Walkerville in just three innings of a 23-0 mercy-rule win. Friday’s opener was a different story for Onekama, as the Sabers teed off in the first inning and plated 12 runs. Onekama used four pitchers in the contest, as Eno was credited with the loss. Eno also led the way at the plate in the opener, hitting 3-for-3 with a double and batting in the Portagers’ lone run in the bottom of the fifth inning. Jon Eno and Josh Jacobs also had a hit for Onekama in the contest. “We had to play our way through that first game,” Neph said. “The lead ended up being just too big, but the fact it was just a 3-1 game after that (12-run first inning), we said we wanted to continue to play that way the rest of the night.